Early Byzantine Pilgrimage Art explores the portable artifacts of eastern Mediterranean pilgrimage from the fifth to the seventh century, presenting them in the context of contemporary pilgrims’ texts and the archaeology of sacred sites. The book shows how the iconography and devotional piety of Byzantine pilgrimage art changed, and it surveys the material and social culture of pilgrimage. What did these early religious travelers take home with them and what did they leave behind? Where were these “sacred souvenirs” manufactured and what was their purpose? How did the images imprinted upon many of them help realize that purpose? The first edition of this pathbreaking book, published in 1982, established late antique pilgrimage and its artifacts as an important topic of study. 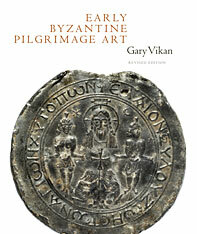 In this revised, enlarged version, Gary Vikan significantly expands the narrative by situating the miraculous world of the early Byzantine pilgrim within the context of late antique magic and pre-Christian healing shrines, and by considering the trajectory of pilgrimage after the Arab conquest of the seventh century.